The drinking and laughing continued into the small hours of the morning and while both Derek and Sylviane woke up with nasty hangovers, the rest is history! On Sylviane’s birthday, Derek took her up CN Tower, to eat in the rotating restaurant. The restaurant is located 150 stories up and offers a 360 view of the city of Toronto. 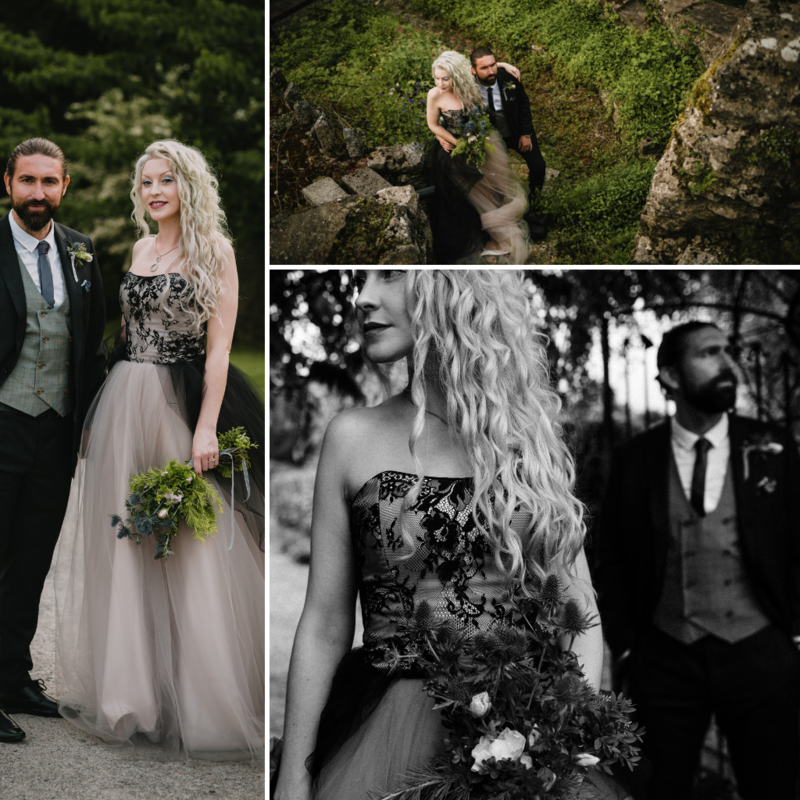 After dinner, the couple went outside to the ledge to see the views and Sylviane got the surprise of a lifetime when Derek got down on one knee! ‘It was magical,’ she adds. The main focus was on guests having a good time. 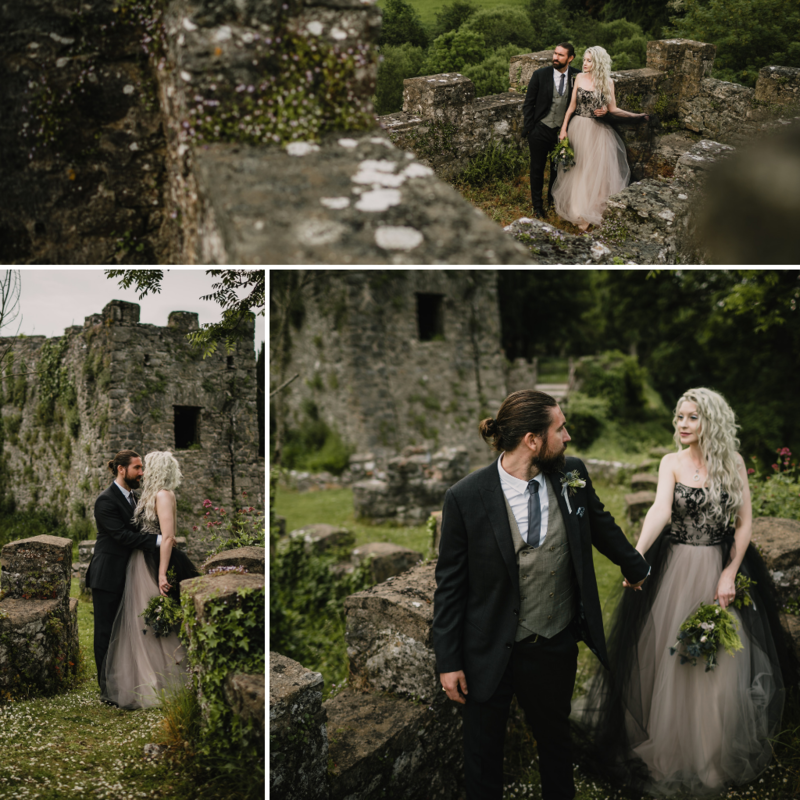 ‘The day was authentic and laid back, with medieval vibes paired with Rock ‘n’ Roll, blues and classic Irish music!’ comment the couple. 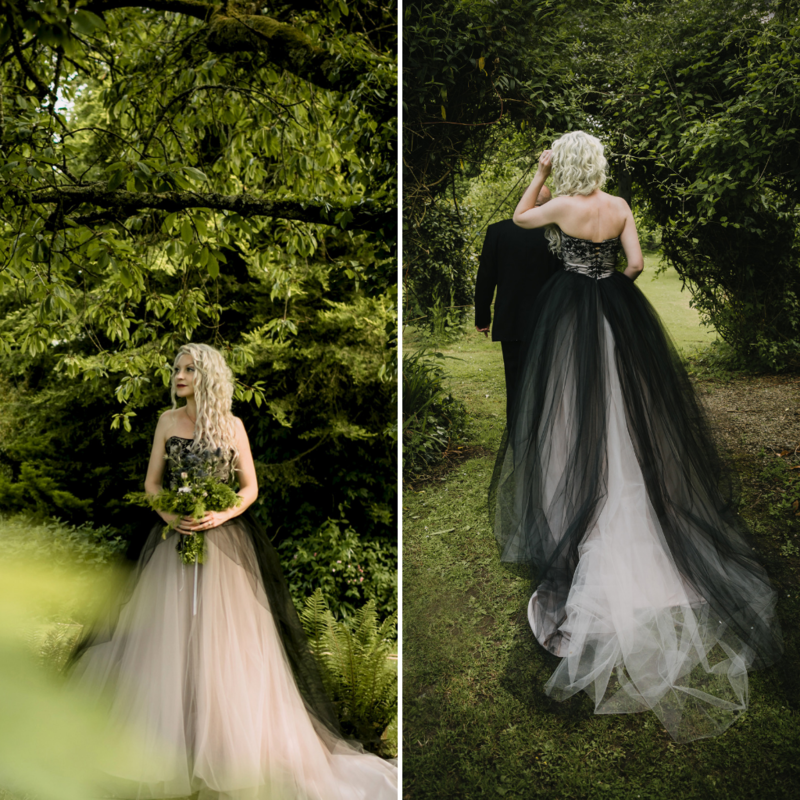 Wanting something very different, working with Colleen enabled Sylviane was able to bring her vision to life. 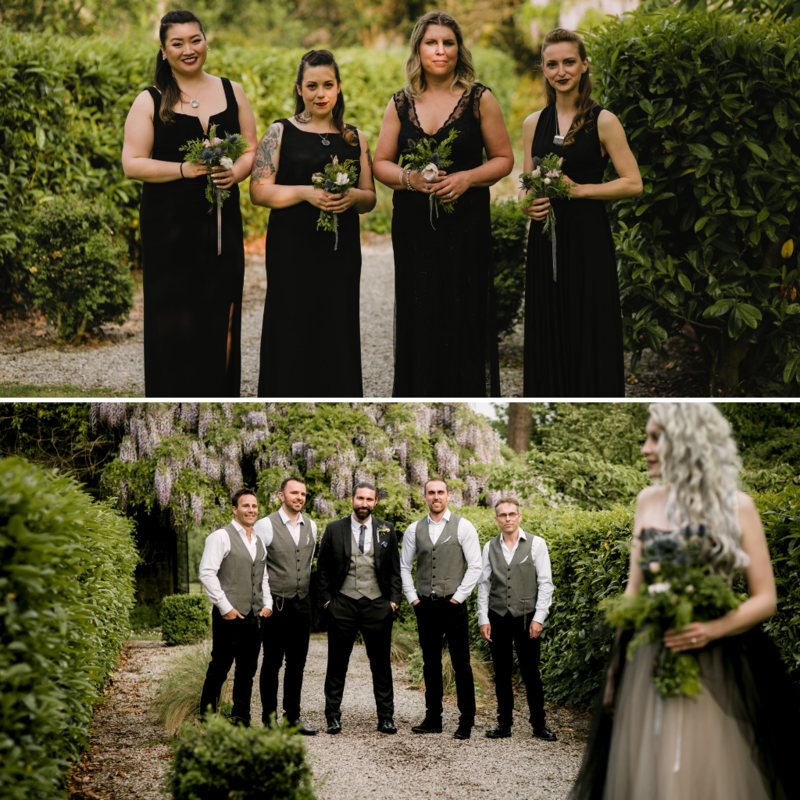 As for the bridesmaids, they were asked to wear a long black dress of their choosing and one they felt fabulous in! 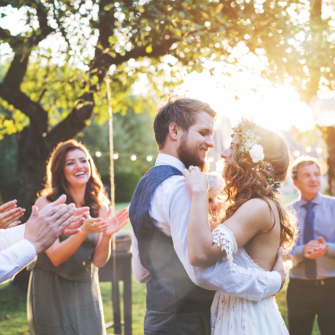 Sylviane set aside the task of decorating her own wedding. 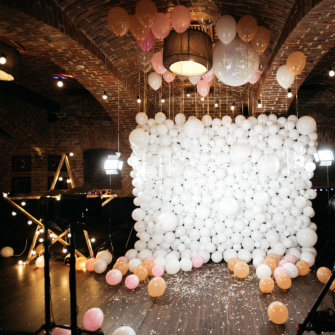 She undertook all the stationery, from invitations to save the dates. 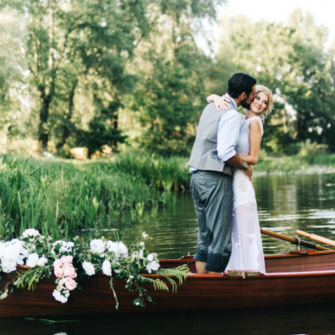 She even built a website, consisting of wedding, travel and DIY travel tips and useful links. 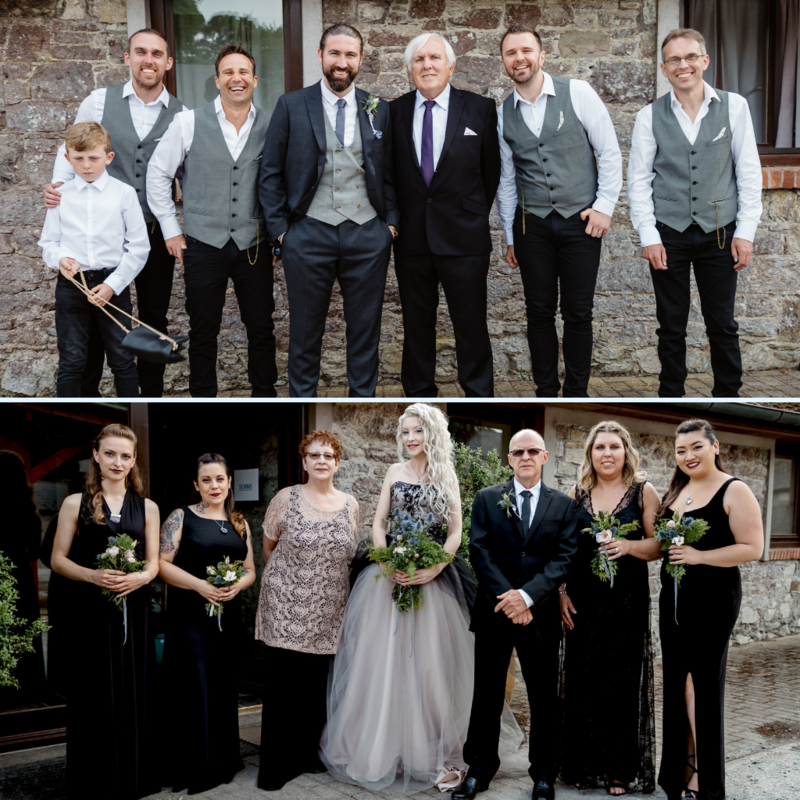 As well as that, she did her own makeup and hair alongside helping create her wedding dress, groom’s suit and wedding party’s attire. Also, she decorated the castle with decorations bought online. ‘It was a real thrill when it all came together so flawlessly and I really enjoyed the process,’ she comments. ‘It was more work than I could ever have imagined, especially from another country. Everything was theoretical. I think I went partly insane that year,’ she laughs. 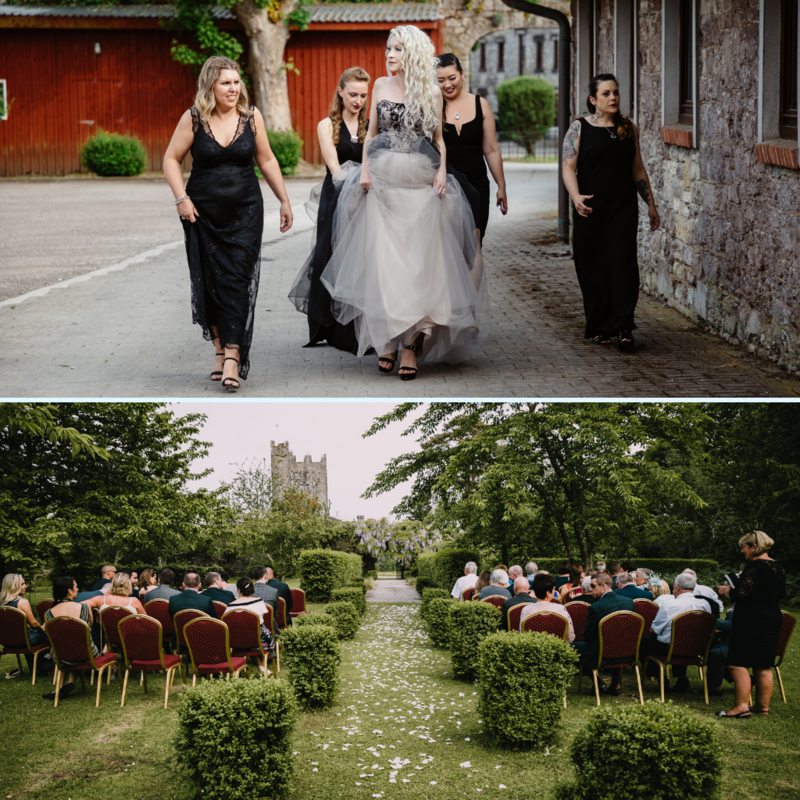 The day before the wedding, Sylviane and her mum visited the castle gardens upon arriving and picked her flowers from there! 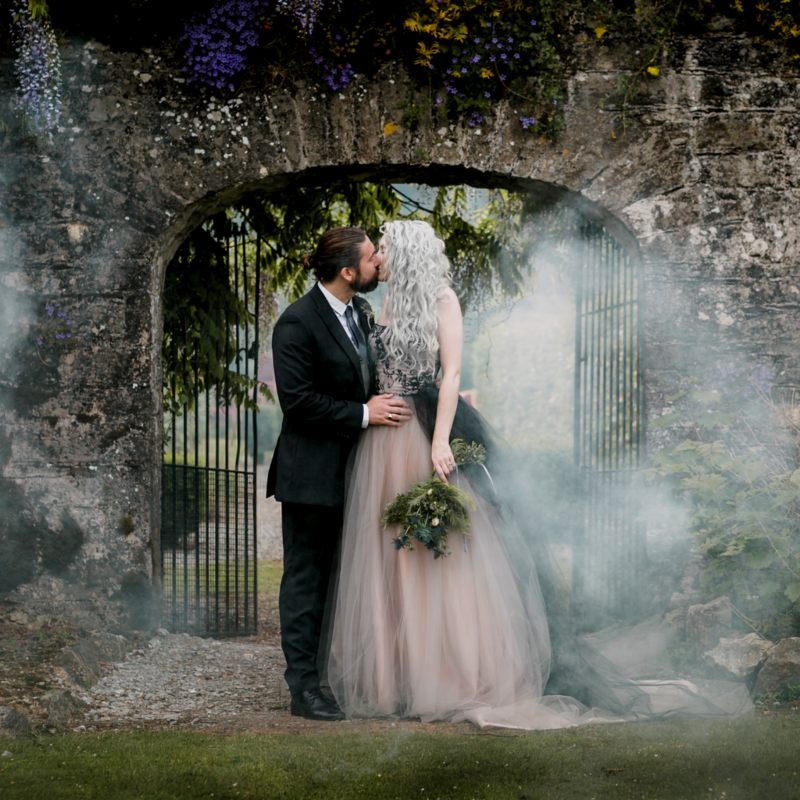 ‘Blue thistles were added for good measure, because they’re my favourite!’ adds Sylviane. After compiling a widespread search for photographers on Google, Sylviane found Mrs RedHead Photography. With the help of Chef Adrian Daly of Made For You Catering, Sylviane and Derek’s guests not only received outstanding food, but were treated to beautiful decorations from the chef himself! 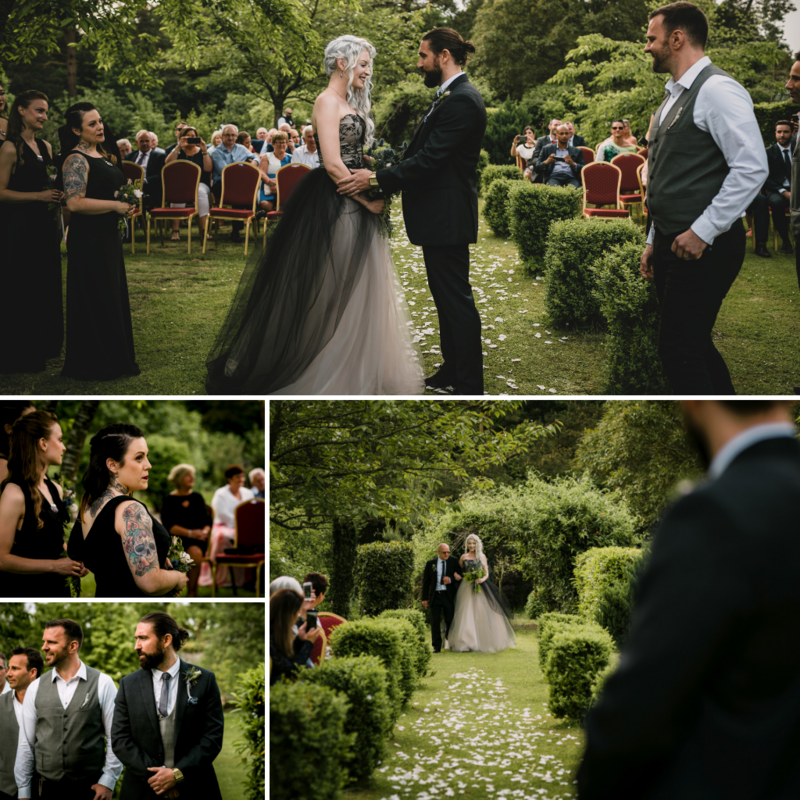 ‘He went so far above and beyond to help my visions come to life!’ she adds. 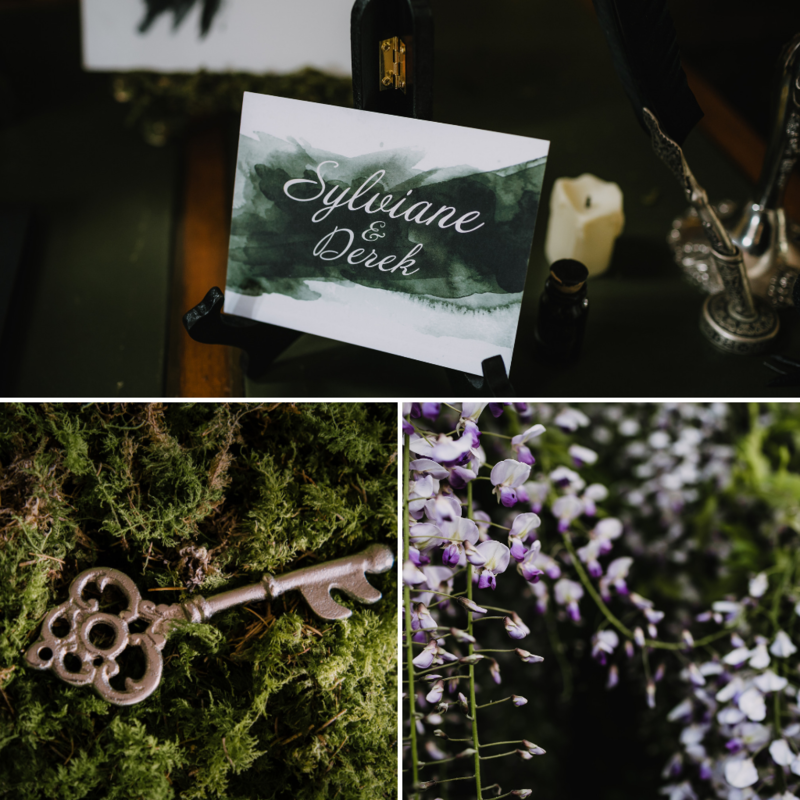 He collected fresh moss, had custom tables made and brought personal items to add special touches the wedding. 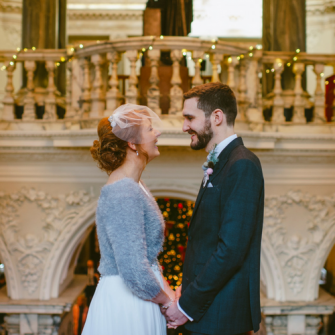 ‘He made the dining room look just like an enchanted forest and guests were absolutely blown away,’ the couple add. Onto the food from this amazing chef, he provided a buffet style and gourmet charcuterie. There were handmade chutney jams, gourmet cheese, a whole honey baked ham, seafood chowder and Irish lamb stew, to name a few. 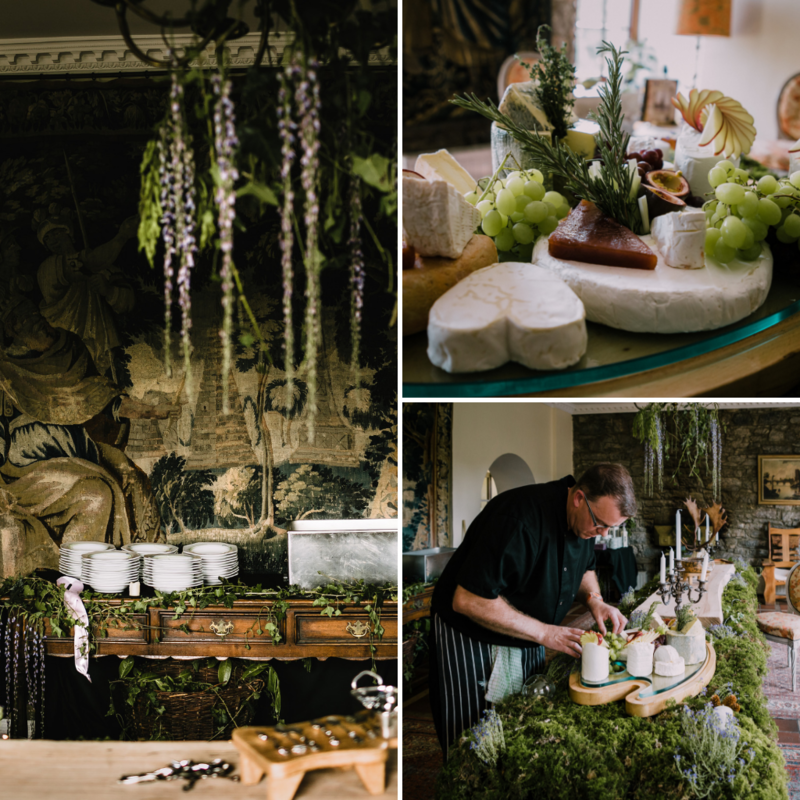 The food sat on a large centrepiece table surrounded by live moss, flower mushrooms and fairy lights and was achieved by Sylviane and Adrian working together for weeks on the design. ‘Adrian then executed the design flawlessly!’ Sylviane confirms. The couple took to stocking the bar themselves, and since there was a private bar in the castle, this worked perfectly, and hired staff to manage the bar the night of the wedding.